Megan Frazer has recovered from injury and has been included in Ireland's World Cup squad for next month's trip to London along with five other Ulster players. The 27-year-old midfielder hasn't played for her country for more than 18 months after having three knee operations following a cruciate ligament injury. But she is now approaching 100 per cent fitness and eagerly looking forward to the showpiece which begins on July 21. Frazer said: "I'm absolutely buzzing for it, and probably even more motivated following such a long time out of the squad. "I had the last of the three operations a fortnight ago after playing for Mannheim in the German play-offs. "It was only minor surgery to remove scar tissue, but it was a complete success and I am now pain-free after a very frustrating 18 months." Ireland are up against USA, India and hosts England in the first phase of the tournament, and their priority will be to avoid last place in their pool. Should they do that, it would guarantee a top-12 finish and a possible quarter-final berth for the team. It promises to be an intriguing World Cup adventure for the Ireland squad. 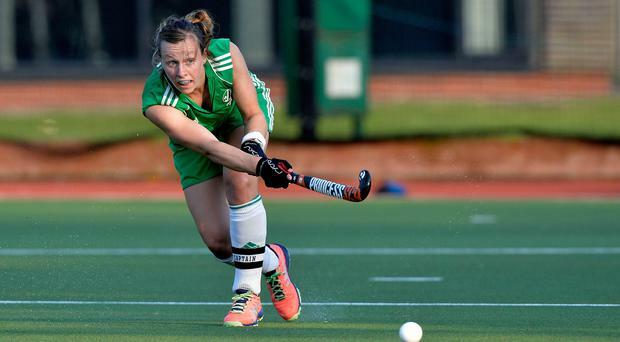 Ireland squad: Ayeisha McFerran (Louisville), Grace O' Flanagan (Railway), Shirley McCay (Pegasus), Yvonne O'Byrne (Cork Harlequins), Hannah Mathews (Loreto), Lena Tice (UCD), Zoe Wilson (Belfast Harlequins), Gillian Pinder (Pembroke), Lizzie Colvin (Belfast Harlequins),Katie Mullan (UCD), Nicci Daly (Loreto), Ali Meeke (Loreto), Roisin Upton (Cork Harlequins), Megan Frazer (Mannheim), Chloe Watkins (Bloemendaal), Anna O' Flanagan (Bloemendaal), Nicola Evans (UHC), Deirdre Duke (UCD).